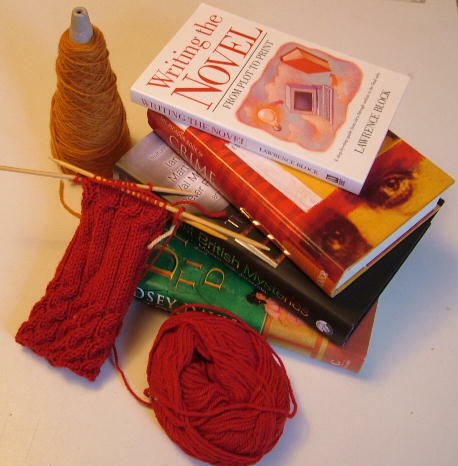 A blog about crime fiction, knitting and writing (or not writing). I've been working for the last 4 days so there's been no time for blogging, knitting or reading really. I have started some new socks but it is too dark now for photographs so I'll do photos in the morning. Bubba is a dog on a diet. He is not very happy about this, but we took him to the vet for his boosters and to get his legs checked out. He had a TPLO operation on his cruciate ligament when he was 18 months old and now he has an arthritic knee. Anyway being a tad on the heavy side is not good for the knees so he has to lose some weight. This means no treats, special diet kibble, no scavenging for food when he's out walking (particular favourite of his!). All in all he thinks maybe life is not worth living at the moment. It's no use trying to explain to a hungry retriever that it's for his own good and he'll feel better once he's shed a few pounds. I'm off tomorrow (and the next few days) so I shall get to S&B and then to the Knitwits group at Perry Common Library. A day full of knitting....bliss! I'm trying to remember the phrase "if your dog is overweight it means you are not getting enough exercise". It's not working, I hope to lie down until the non-dogwalking guilt goes away! I've been knitting for more than 40 years (help, how did that happen), working with books for 12 years, spinning for 5 years and am learning to weave. I live in the Black Country with Pete, the Evilpixie and Bubba the golden retriever.